Add a Client ID to policies to generate billing receipts that are itemized by client and enhance client tracking. If you are an Approved! accountant, it's best practice to add a Client ID to each of your client policies to easily identify clients, track their revenue growth, and produce monthly receipts that make billing a breeze. Client IDs can be added or viewed solely by an Approved! accountant. To add a Client ID to a policy, head to Settings > Policies > [Policy Name] > Overview. Here, you will be able to add any alphanumeric internal unique identifier for your client's policy. If your client has multiple policies, it is especially useful to add a given Client ID to those policies. Pro-tip: Having a hard time deciphering which policy pertains to what client? Adding a Client ID to all policies will allow an Approved! accountant to easily identify a policy. This works best when billing is consolidated to one owner and all policies all labeled with a Client ID. Are you not yet an Approved! Accountant and would like to become one? Please take our ExpensifyApproved! University to kick off the process! By adding a Client ID to each of your policies, the billing receipt created each month will be itemized per client, with a breakdown of unique active users respectively. 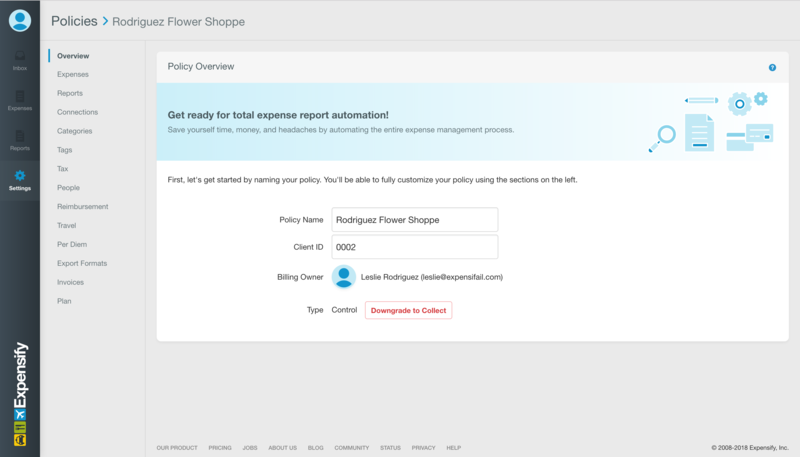 If you choose to not use a Client ID for a given policy, then the billing receipt will display all unique users per policy. If there is a mixture of these, the billing receipt will reflect a breakdown by Client ID and policy name. All billing owners are automatically emailed a PDF version of their Expensify billing receipt every month. To download a CSV version of billing breakdown, head to Settings > Your Account > Billing & Subscriptions > Billing History and click on Download Receipt CSV. The CSV version of the receipt will also include an additional column that specifies if the client policy is Team or Corporate.